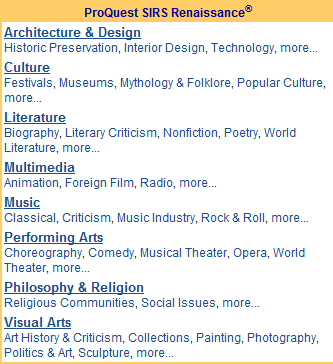 SIRS® Renaissance—Current Perspectives on the Arts & Humanities—is a reference database that provides dynamic information on the following topics: architecture and design, culture, literature, multimedia, music, performing arts, philosophy and religion, and visual arts. Full-text articles are selected from more than 1,500 domestic and international publications. Many articles are accompanied by full-color images, including art reproductions, photographs, and illustrations. Articles and images in SIRS Renaissance are carefully selected according to strict SIRS criteria for content reliability, relevance, and age appropriateness. 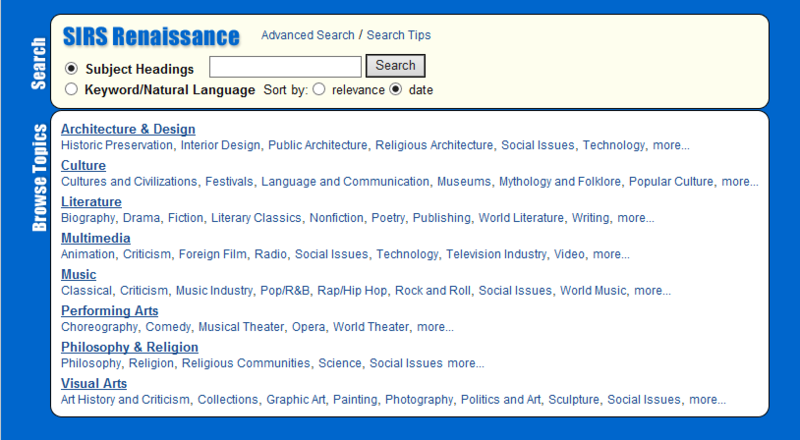 Users can easily retrieve information by subject heading, topic browse, and keyword searches. 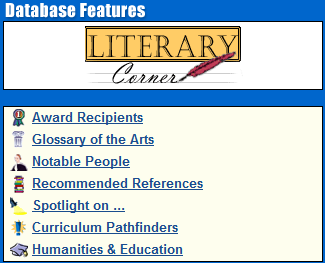 The articles are indexed according to Library of Congress-derived subject headings to ensure the best results can be printed, saved, and emailed. State and National Standards Correlations, including Common Core Standards, help educators locate standards-aligned articles and other resources, which saves teachers time in the lesson-planning process, and ensures that library resources are correlated directly to learning benchmarks. SIRS continues to 'Take Aim' at Common Core Standards with this brand new SIRS Common Core Writing Guide directly supporting requirements under the category of writing logical arguments to support claims. The 6-step writing guide correlates 8 Common Core Standards to content, features and tools in CODiE Award winning SIRS Issues Researcher.